At the start of a new school year, elementary school teachers make pilgrimages to art and school supply stores, searching for brightly colored posters and bulletin board decorations that will make their otherwise drab, standard-issue classrooms into a more engaging learning environment. Teachers at the Niki-de-Saint-Phalle school in the Saint-Denis suburb of Paris, however, won’t have to worry about that kind of thing; their entire learning environment has been professionally designed by architect Paul le Quernec into a multi-hued, modernist educational paradise. 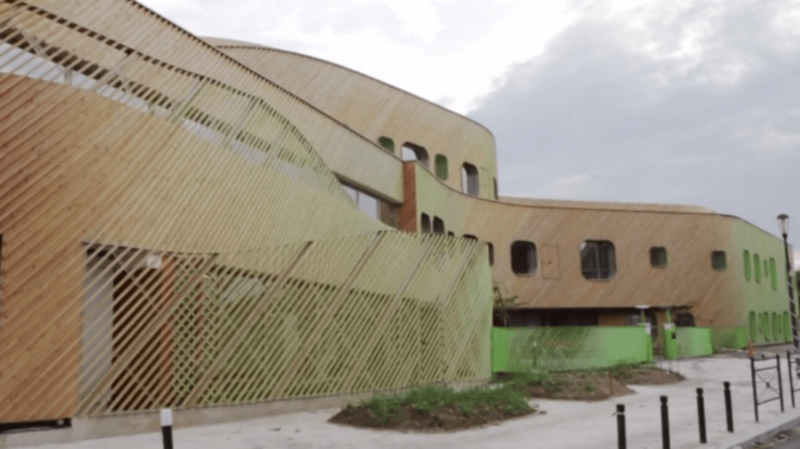 The school in Saint-Denis is a dual-purpose space, used to teach both preschool and elementary-aged students. Le Quernec drew inspiration from the left and right hemispheres of the brain to design the two wings, reasoning that children of different ages learn in different ways. For the younger children, le Quernec designed rooms with soft curves in varying shades of orange, conveying a gentleness of approach while hoping to stimulate creative thought with the warm, bright hue. Older children, whose education requires more structure, sit down to desks in more angular spaces, painted green to foster concentration. The school’s external façade effectively melds the two color schemes, cleverly constructed from painted wood in such a way that the building appears to be orange from some angles and green from others, depending on where the viewer is standing. Book lovers will especially appreciate le Quernec’s design for the children’s library, painted in soothing white with warm light and plenty of benches and igloo-shaped reading nooks. Rose-hued corridors lead children through the airy entrance hall to the school’s two playgrounds, and light comes from a combination of whimsically shaped floating lamps and the sunlight filtering in through large transparent doors and windows. Even the fire extinguisher has its own purpose-designed space: in a stark white hallway, a bright red nook shaped like a flame denotes where one can find the necessary fire safety equipment. Despite the deliberate logic evident in every detail of the Niki-de-Saint-Phalle school, le Quernec admits that his reasoning is based less on hard science and more on an artistic sensibility: “My answer will be considered as very pretentious or very irresponsible, but the truth is that I draw these spaces with my intuition and my childhood memory.” It is a style that carries through to his other designs for school buildings, evident in the enormous open reading space of a nursery school library in Illkirch, the quirky cafeteria chairs in an elementary school in Briarres and the multicolor polka-dotted exterior of a school in Montpon. Le Quernec’s conceptual architecture doesn’t stop there. A nursery in Sarreguemines, designed in collaboration with architect Michel Grasso, bears no small resemblance to a cell of the body. The nursery itself is the nucleus, enclosed by gardens representing the cytoplasm and a surrounding wall as the cell membrane. The red-and-white entrance is explicitly intended to be “vaginal,” with the building’s general curves and non-linearity meant to evoke a sense of uterine comfort in both young children and their parents. Though the design itself may be subtle, le Quernec’s nods to his inspiration are not. If walls could talk, le Quernec’s school buildings would have plenty to say.